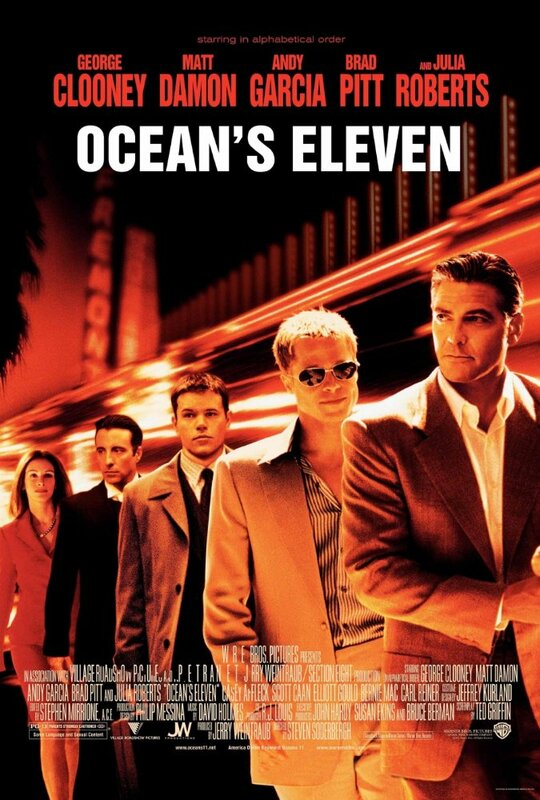 Cast: George Clooney; Brad Pitt; Julia Roberts; Andy Garcia; Matt Damon; Don Cheadle. Content Rating: PG 13 for some mild language and sexual content. What a deliciously irresistible synopsis. As soon as I saw it, I had to buy this movie. A casino heist? With the likes of Brad Pitt and George Clooney? YES PLEASE! It was breathtakingly slick, oozing with star-power, and so beautifully watchable and entertaining. Thanks to the phenomenal cast, every character was deep and three-dimensional. The shots of humour were brilliantly on point and more often than not, it came from the delightful contrast of characters. It was so clever, so sharp, and the dialogue was tight and witty. The frequent absence of music was a brilliant move; it made the film all the more exciting (which was a surprise) and raw, real, and breathlessly tense. It was so satisfying and exciting. Very cool, very smooth, with a very good-looking cast, it was effortlessly entertaining and pure class. The lack of female presence was solely felt. Julia Roberts was the only female in the movie, and despite her unarguable talent, she had a weak and small role. And, I say it again, she was the only female. That was very disappointing. I wish Ocean's team had been a mixed bunch of guys and girls, and I think that would have been a huge improvement. Talk about a star-studded cast! 😍😍 A casino heist definitely sounds very interesting. It's disappointing to read that there is a lack of female characters in the movie - there are many famous actresses! But moving on, movie sounds really cool and it's now on our To-Be-Watched list! I know, it was very disappointing :( But yeah, the movie is still very cool and exciting! Hope you both get to watch it soon! Lordy I haven't thought about this movie in years. I think I might have to do a re-watch. Glad you liked it! Lol, a re-watch will be fun :) Thanks, me too! I love the movie but yeah the lack of females is a little unsettling. It would have been awesome to see more kickass, brilliant females! It would have made the team more fun! Ooooh yes I totally agree! They really should have done that!